Let’s make things that help us know each other in new ways, that excite not only our minds but also our bodies. What can make expressiveness more welcoming? We’ll find ways to cope with the overbearing void and the hyperanxiety from online addiction. Sometimes vision and voice are cultivated from the simplest mediums. 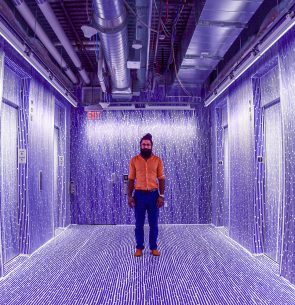 Kawandeep Virdee uses technology and art to explore ways we can create meaning and joy collectively. He co-founded New American Public Art to build interactive art that makes public spaces more communal and welcoming. Similarly, his internet art strives to encourage collaboration, play, and creativity. His works have shown in venues including the Massachusetts College of Art and Design, Facebook, Rose Fitzgerald Kennedy Greenway, Boston Convention Center, Sculpture Visions in Chapel Hill, SFMOMA, Detroit Design Festival, Art & Sol in Saginaw, Suffolk University, Transmediale in Berlin, the MIT Media Lab, and EYEO/Northern Spark. Talks and workshops include MIT, Google Creative Lab, Facebook, Society of News Design, EYEO, FITC, INST-INT, International Conference on Complex Systems, Connected Communities Symposium in Newcastle, Art Institute of Boston, Tech@State, Betascape at MICA, A Better World By Design at Brown/RISD, Robotsconf, IstanbulHS, Makerland in Warsaw, and JSConf. His works have been covered in publications including the Atlantic, Science, Vice, NewScientist, Make, Core77, the New York Times, the Globe, and Art Digital Magazine. He is on the product team at Medium.